Most of us have that room in our house. 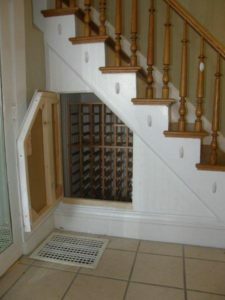 You know…… the over-crowded room in the basement that is the go-to space for storing random items you rarely (if ever!) use. 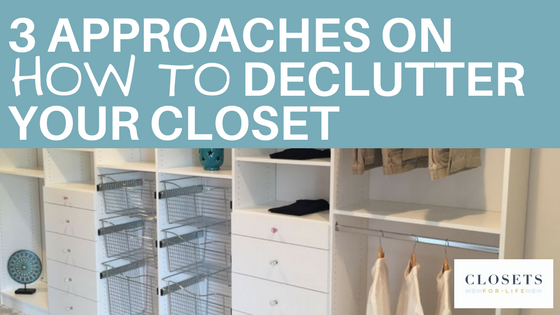 We don’t intend for it to become an over-filled catch-all space. 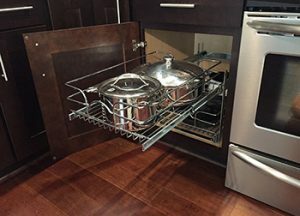 We start by saying we’ll just store an item there until we have time to go through everything. But days turn to months and months to years and eventually the room is packed to the gills with stuff! Today we want to show you what this room could be with just a bit of TLC. 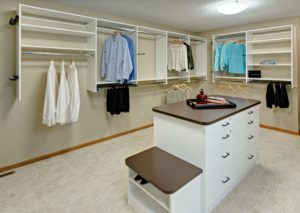 Our clients came to us wanting to transform their basement storage room into a multi-purpose space. The room’s only purposes up to this point was for laundry (the room housed the washer and dryer) and storage, lots and lots storage. 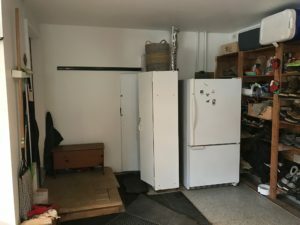 The space was large but so overwhelmed by bins and items that it felt small and cluttered. 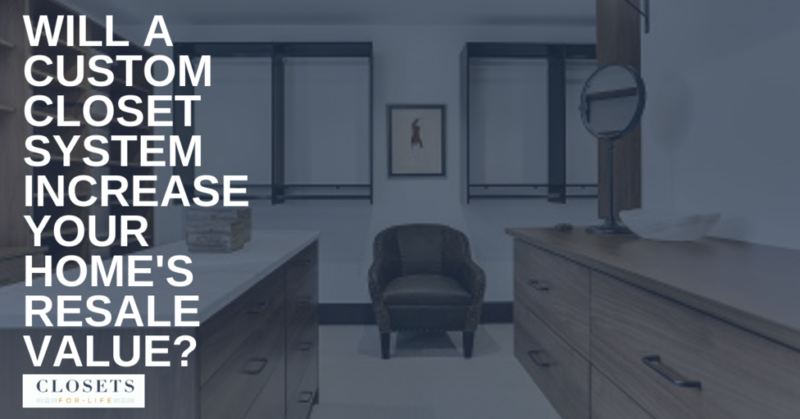 When we met with our clients during their free in-home consultation, they expressed their wish to transform the room into a multi-purpose space. 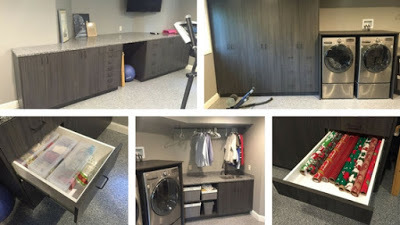 The washer and dryer needed to stay but they also wanted to incorporate space for exercise and a crafting/wrapping station, all while still maintaining some storage capacity. 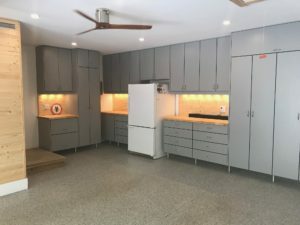 Their plans were to empty the room of its contents, sheet rock and paint the walls and finish the cement floor with an epoxy finish. They wanted us to design and install an overall cabinet and storage solution that tied the room together and assisted them in using the space for multiple purposes. 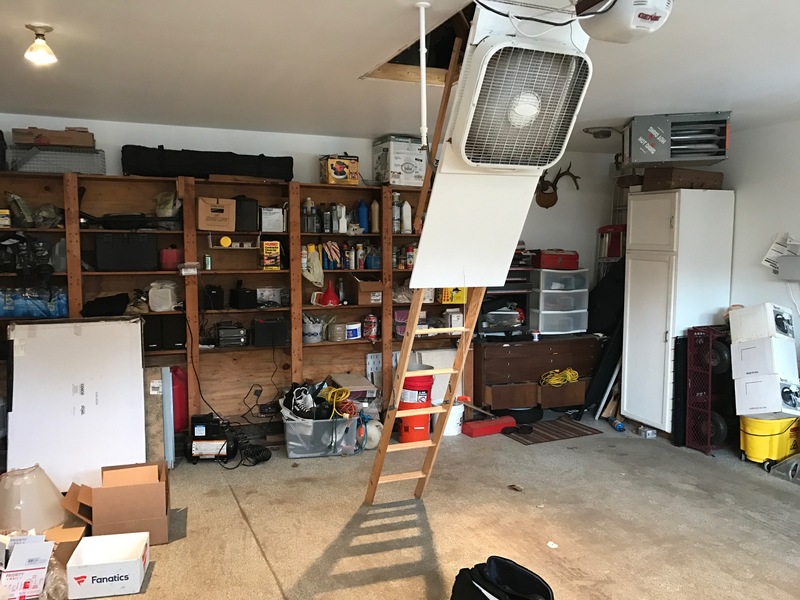 We set about designing a solution that would run along two of the walls, leaving ample space for exercise equipment in the center. 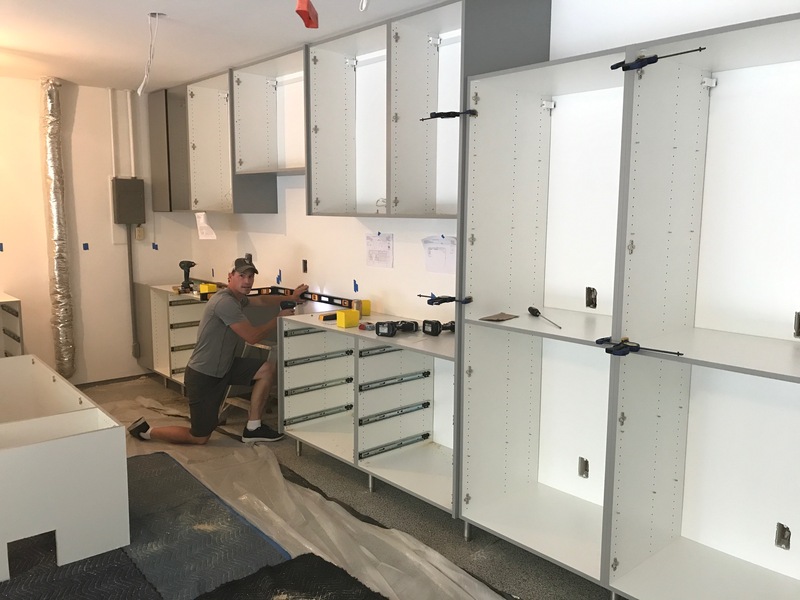 Running along one wall, we installed base cabinets with custom sized drawers for holding wrapping paper and craft supplies. The wrapping paper drawers are 40″ deep, big enough to hold 3′ rolls of wrapping paper! 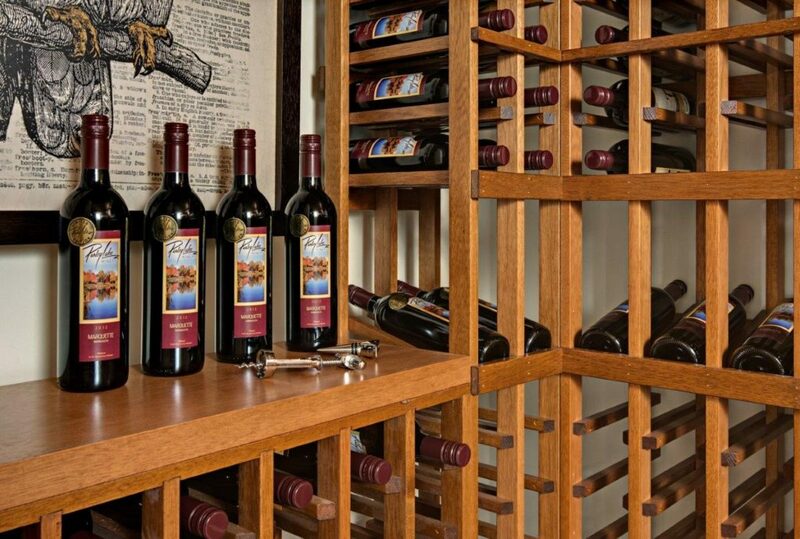 Ample counter space provides plenty of room for crafting or wrapping. 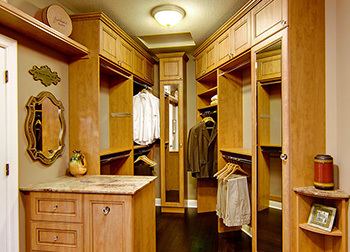 A TV mounted above the craft space can be used while exercising. 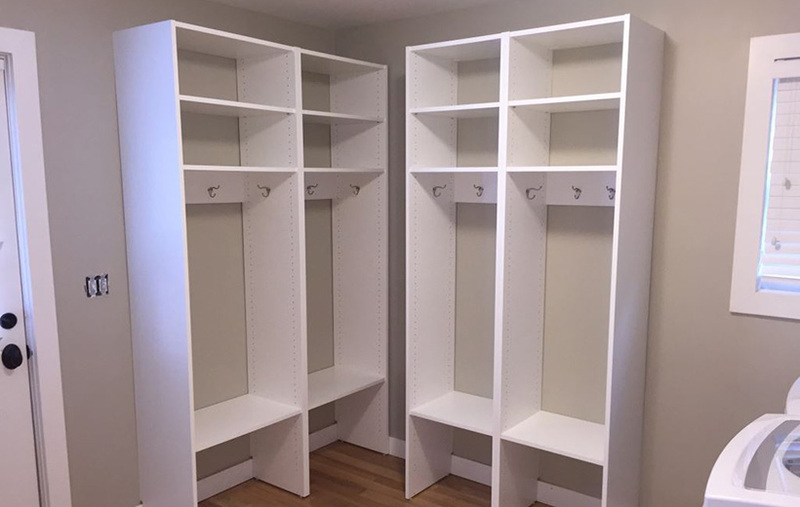 Along the second wall, we incorporated tall storage cabinets for hanging seasonal clothing items and other laundry storage. 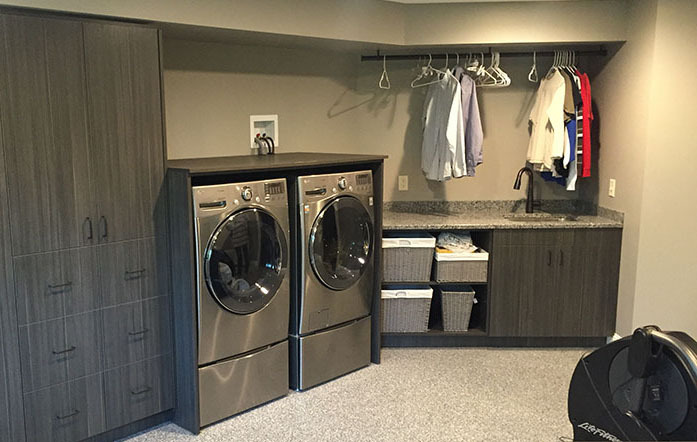 The washing machine and dryer are encased, providing a counter space above the units for folding and a base cabinet to the right of the washer and dryer can be used for laundry supply storage with a hanging area for clean clothes above. 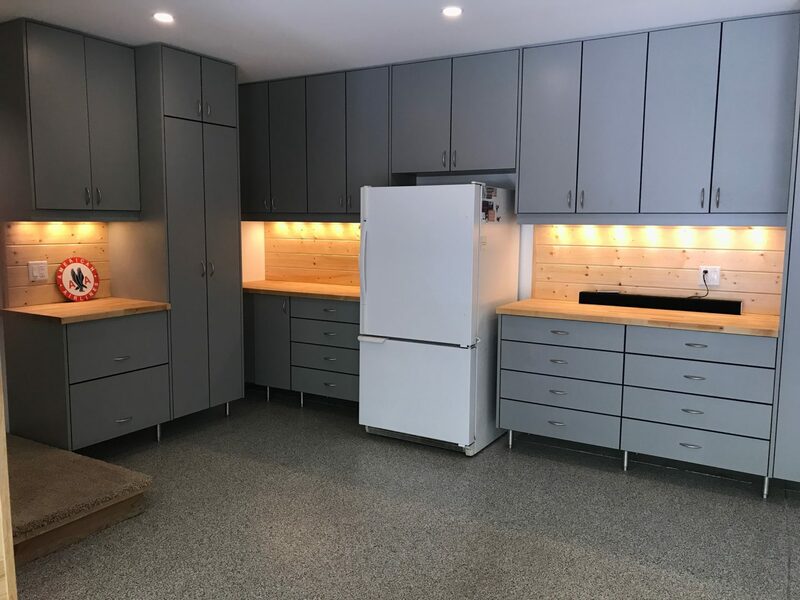 All of the cabinetry was constructed using Stevenswood Artika textured melamine in Takase Teak which gives the room a sophisticated and polished feel. All together, the transformation was amazing! Our clients were overjoyed with the results, having gained a significant amount of new usable space in their existing home. To see larger photos of this project, click here to visit our Houzz page. Have you ever had a project where you couldn’t find anyone to take the job? 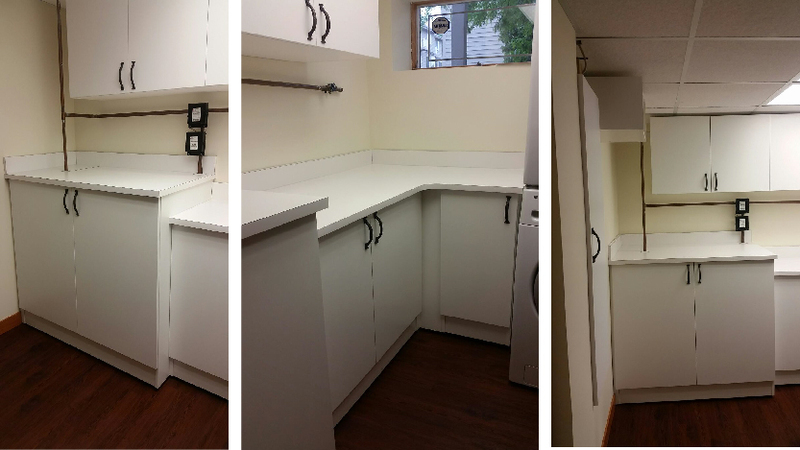 We recently had a client come to us wanting to add work space for laundry and upper cabinets for storage to her basement laundry space. 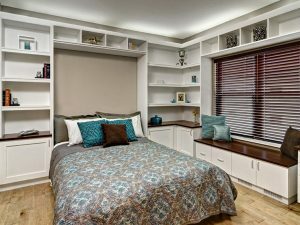 Other contractors had been out to her home to look at the space and but no one wanted to do the job due to the complexity of the project. 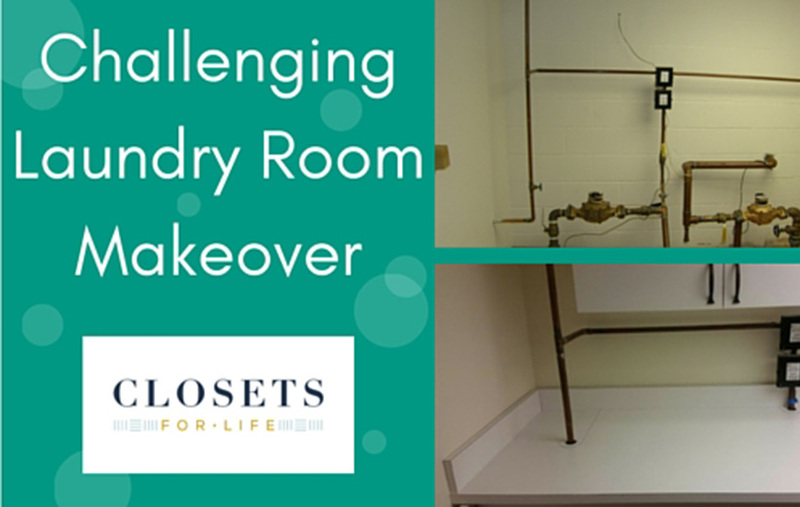 The challenge was due to a maze of plumbing and water valves that made the space unusable and the room an eyesore. Needless to say, we took the job and set about designing an organization solution. Our client’s wish list included a flat workspace to fold clothes on, upper cabinet storage and a built-in fold-out ironing board. 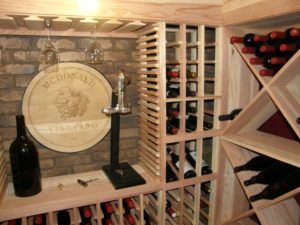 In addition to addressing our client’s wish list, our design needed to work around the unmovable pipes while masking them as much as possible. However, we also had to ensure that there was still access to the water meter and shut off valves. With the washer and dryer located to the right of the pipes, we designed a solution to run along the wall of pipes using lower cabinets to hide the piping and valves while still allowing access. 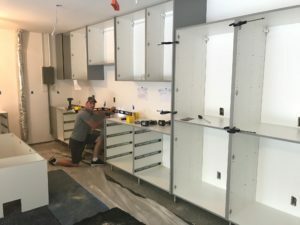 We custom notched the counter tops to accommodate the pipes coming up from the lower cabinets, delivering the work space our client desired without compromising the piping. 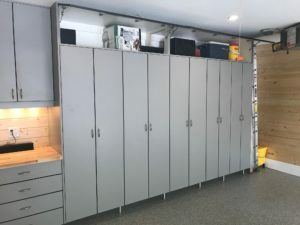 A built-in fold-out ironing board was mounted on the left wall and the lower cabinets wrapped around the right wall abutting the washer and drawer. 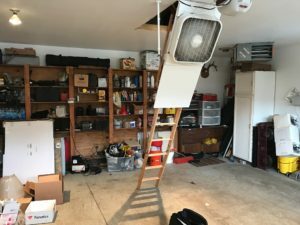 Installation was understandably tricky and we worked carefully to insure the piping was not compromised. Our client was thrilled with the results. 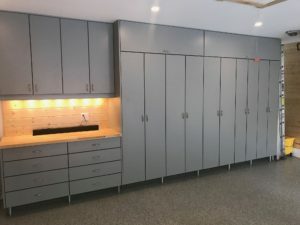 Not only did she gain the functionality she desired, the room was transformed from an unfinished, dreary space into a polished, organized room with the laundry cabinets and storage she had always wanted. The installed cabinetry, paired with new flooring and a fresh coat of paint, dramatically changed the feel of the room. Our client told us that she couldn’t believe it was the same room! To refer to a quote from the playwright Moliere – “The greater the obstacle, the more glory in overcoming it.”. Perhaps glory is a bit grandiose but we are pretty proud of our work and it feels great making our clients happy. If you have kids who play sports then you’ve probably experienced first hand the struggle to get out the door on-time to a practice or game with all of the necessary gear. Having all of your gear organized and ready in one spot is a key play in securing a win for your home team (and family happiness!). Here are three steps to organize your kids’ sport gear and make getting out the door a breeze. Collect all (yes, we mean all!) sports gear in your home in one location and sort it by sport and child. Go through each item to determine if it’s still needed/used and if not, throw or donate the item depending on the condition. You will probably end up with a lot of single soccer socks, one football glove, etc. but resist the urge to keep them ‘just in case’! The system that works for you is going to depend on your home layout, the number of kids you have and the number of sports they play. 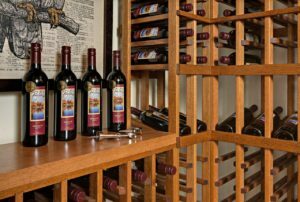 However, we have one key recommendation no matter what your situation. 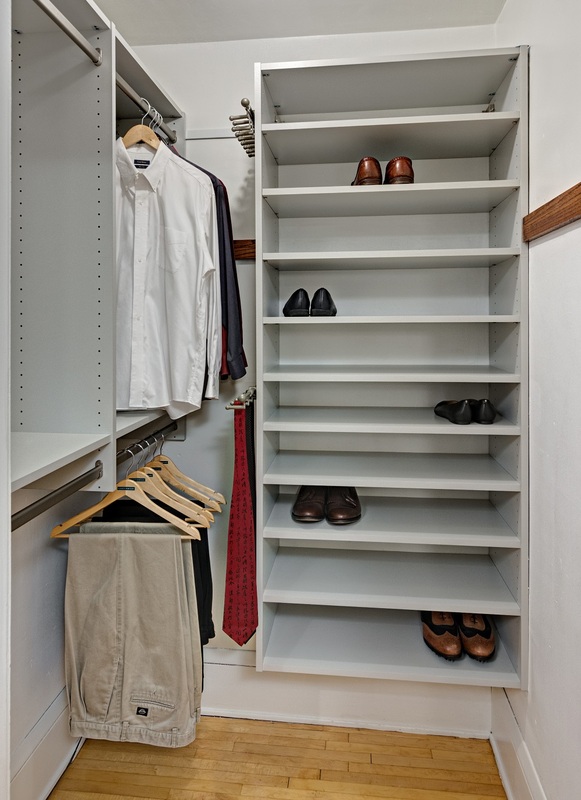 Keep all items for the current sport(s) in one spot, preferably the mudroom or garage or somewhere else that doesn’t involve a long walk through your house. Baskets work well for holding gear like balls, shoes and pads and we recommend having one basket per sport. 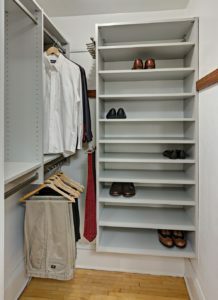 Hooks or a shelf above the basket are a great way to keep uniforms together with the gear but not crumpled and crushed in the basket. If mouth guards are used, purchase a retainer storage case that can hold the mouth guard and still allow it to be stored in the basket. As sports change, simply move out the current sport basket into storage and move in the new sport basket. Step 3: Coach your Team! 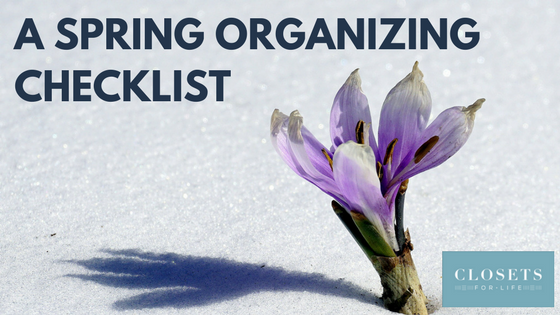 Just as your kids need to learn different plays or strategies for their sports, your new organization system will only work if your kids learn and follow the new organization strategy and practice, practice, practice! 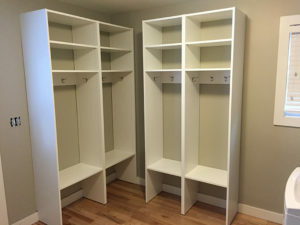 Make your kids the star players in this new strategy and enforce the idea that all sports items are returned to this spot immediately after returning home from a game or practice with the exception of dirty uniforms which can be washed first and then returned to their hooks. Employ this winning strategy and your home team is sure to be champions! As with any great team, a solid foundation in the basics can make all the difference. 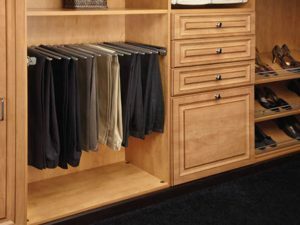 If you feel your mudroom or garage could benefit from a custom organization system, like the lockers pictured above, to provide the right foundation for your new organization strategy, contact Closets For Life.